Lichens are more likely to grow on crape myrtles (Lagerstroemia indica) in areas with long periods of high humidity and on branches exposed to full sun. Lichens are fungal epiphytes, not parasites, meaning they get their nutrients from the air, not the tree they're growing on. Crape myrtle cultivars range from 18 inches to 40 feet tall and grow in U.S. Department of Agriculture plant hardiness zones 7 through 9. A close-up of lichen growing on a limb. Although gray-green lichens may look ugly on a crape myrtle's bark, they won't do physical harm. Lichens thrive in sunny parts of a plant with few leaves, but are not responsible for thinning leaves. If there's an ice storm, lichens can add a heavier load of ice to a limb, increasing its chances of breaking. Lichens need sun for photosynthesis, and they won't grow in the shade provided by the leaves of vigorous trees and shrubs. Proper watering and fertilizer applications that promote the growth of leafy, shady canopies can help suppress lichen growth on a crape myrtle's limbs and twigs. 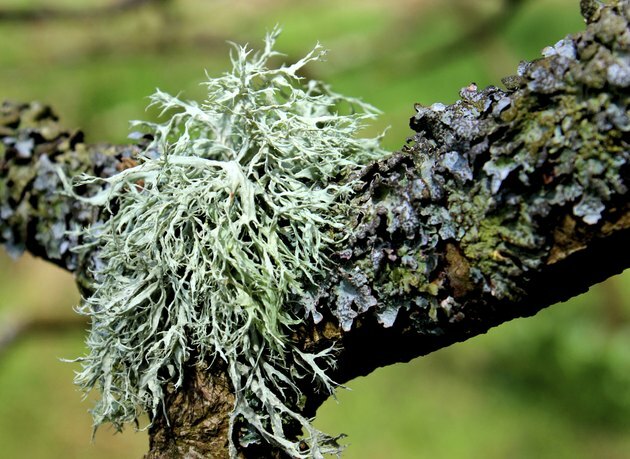 Pruning lichen-encrusted limbs lightly may encourage the growth of new shoots and limbs, also providing shade to discourage lichens. Extremely unhealthy trees and shrubs may not respond to better care and you may have to replace them. Although they may not work on lichens, some copper-based antifungals, including Bordeaux mixture may help. To prepare Bordeaux mixture in a quantity suitable for a backpack sprayer, dissolve 1 pound of copper sulfate in 1 gallon of warm water in a plastic bucket. In another plastic bucket mix 1 pound of fresh hydrated lime in 1 gallon of water and let it stand for two hours. To make 2 1/2 gallons of Bordeaux mixture, vigorously shake the copper sulfate solution and add 1 quart to 2 gallons of water then shake, and then add 1 quart of the lime solution. Shake or stir the mixture for several minutes before adding it to your sprayer tank. Spray on a clear day with little or no wind and temperatures between 40 and 70 degrees Fahrenheit in spring. Mix only enough Bordeaux mixture to use in one session. Saturate the areas of the crape myrtle covered by lichen. You should begin to see results immediately. Wear goggles, gloves, a long-sleeved shirt and long pants when spraying Bordeaux mixture. Keep children and pets out of the area while you're spraying. You can buy copper sulfate and hydrated lime at most garden supply stores, but they're toxic and corrosive. Store the ingredients in stoppered glass containers out of the way of children. If you think somebody has inhaled or eaten the copper sulfate or hydrated lime, call a doctor or the national poison control emergency hotline at 1-800-222-1212. The hotline is run by the National Institutes of Health and is available 24/7.